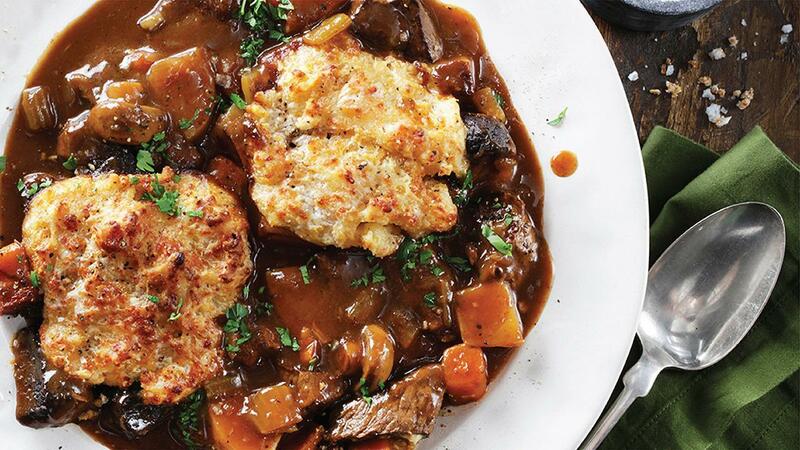 The classic British beef stew has retained its signature features over the years & it has been considered one of the most popular comfort food for generations. The cheddar cheese dumplings give this classic a great twist! View full recipe below. In a sauce pot, add corn oil over medium heat and fry the beef cubes until browned on all sides. Remove the beef cubes from the pan and set aside. In the same pot, fry the onion, celery, and carrots until soft and fragrant, adding a little oil if necessary. Add garlic and fry for another 30 seconds. Stir in the tomato paste. Mix and Add Knorr Demi Glace Brown Sauce mix and water, Knorr Chicken Seasoning Powder and Worcestershire sauce ; allow to come to a simmer and stir with a wooden spoon. Add the beef cubes back to the pot then add bay leaves, cinnamon stick and thyme. Reduce to a simmer and cover, simmer for 1 ½ hours. Add the potatoes and simmer for another ½ an hour or until the vegetables are tender. Remove the bay leaves and thyme branches, if the stew is still thin just add little bit Knorr Demi Glace Brown Sauce Mix dilute with little water; stirring occasionally, simmer for another 10 minutes. Stir together the all-purpose flour and garlic powder in a medium bowl. Cut in the shortening until mixture resembles coarse crumbs. Stir in the cheddar cheese, then add the milk and stir until the dry ingredients are moistened. Make small balls with the dough and place them on top of the stew, leaving them room to expand– they grow a lot as they cook. Place the stew in the oven uncovered and bake until the dumplings are browned and cooked through, about 30 to 40 minutes. Garnish the stew with parsley and serve.